Let's revisit a fun technique this week, shall we? One of the "scariest" new things for me to learn was heat embossing. 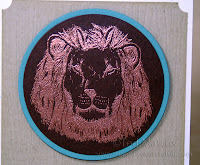 I often admired the heat-embossed works of others, only to shy away from the tools and beautiful powders at the craft store, for fear of not knowing how to use them. If only I had been able to see this video! I would have tried it much sooner! Please allow me to introduce our guest tutor, Ted Mattos who hails from sunny California and his blog, Happily Ever Crafter. Watch as Ted demonstrates heat embossing and uses tools like the ani-static pillow and the clear embossing powder for tone-on-tone images. I think that what I love best is his mastery of the zoom-in views that show how beautiful a heat-embossed image can be! 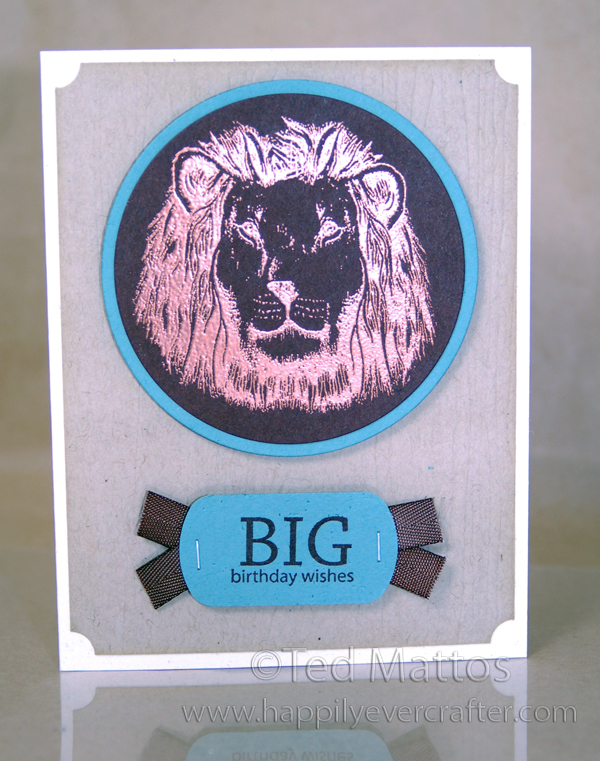 Here is a recent card that Ted made using a beautiful copper powder on a dark colored cardstock. Look how masculine that metallic lion is! Thanks for sharing, Ted! Enjoy the video and please stop by Ted's blog to give him some love for tutoring us today. -Nancy K.
You can also click to go to the original blog post by Ted, that includes this video, for even more tips and tricks and a few good giggles too. Ted's blog is so much fun! Thanks for watching! And now heat embossers, show us your skills! Post any card that includes a heat embossed image or sentiment. Great tutorial! 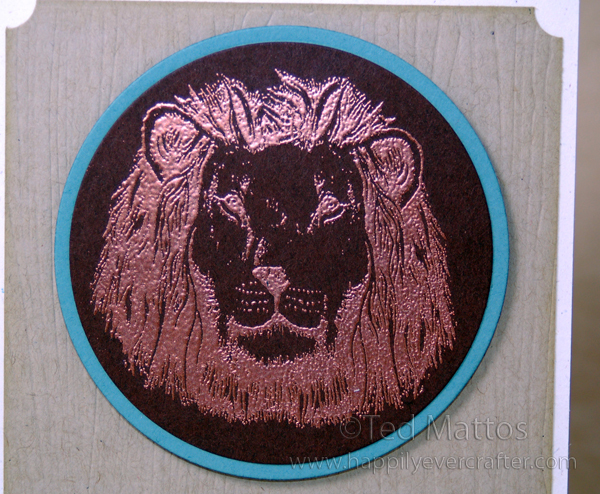 It's been a while since I've done heat embossing but now I want to get my supplies out and I will probably be totally hooked all over again. I love the copper! Great tutorial. 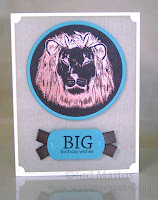 Ted's tutorial took the mystery out of embossing for me. Now I will go and try it out for myself. Thanks Ted! Great tutorial! Very clear & the close-ups really show the magic moment with the heat tool. Ted, thank you!